Photographer, sound artist and label manager Taylor Deupree took to recording the festivities housed under the Social Club one April night in Melbourne, Australia. With good reason, too, for the night displayed here bristles with a vast array of events, too numerous to catalogue. 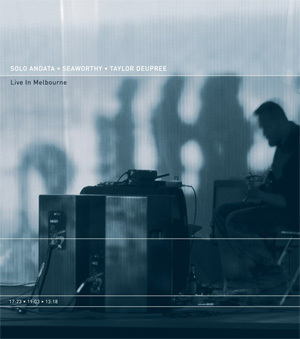 The sonic endeavors of Solo Andata, Seaworthy, and Deupree himself, are filtered through a refined sensibility, resulting in a work of coherent flow and balance, and, perhaps most importantly, an ephemeral elegance bound to a very real sense of time and place. Solo Andata, who released the splendid Fyris Swan on Hefty Records some while ago, gives this album its first breath. As on that album, the duo display a feel that is gimlet-eyed and spartan, with woozy but tight harmonies winding through loops and whispers of distortion added for tonal color. There is something quite alluring about the discernment and lightness of touch that the duo possess in the ease with which they see the elements carefully through a varied series of deconstructions and reconstructions – moving blithely and effectively from glassine timbral masses, with piano rotating in eccentric orbits, to ethereal and minimalist, to finally a tempered sort of jazz, where isolated guitar lines sound over a shimmer of metallophones, embedded in a galaxy of bass drones. From here, Seaworthy provides a variation on a track initially featured on his 12K release, Map In Hand. His performance style is intensely fleet. Over the course of the nineteen-minute composition, slow, moving acoustic guitar figures tighten and relax across continually shifting tempos, found sounds, and sonorous humming. In a piece that seems lo-fi in comparison to the meticulous nature of his full-length albums, Deupree says the final farewell with a staid, intimate, and attractive electronic composition that constantly seems to be withdrawing into itself so as to amass itself upon itself. On a whole, there is a reasuring, wraparound quality to much of this recording, like soaking in a forest pool.